Everyone is always so interested in a mermaid's fin and shimmering scales, but we are always more intrigued by a mermaid's luscious hair. Sure, a mermaid's tale is both beautiful and fascinating but the hair is really what makes us women jealous. Not only is it thick and luxurious but the saltwater gives it a sparkly sheen that our conditioners just can't achieve. Unfortunately we all just can't take a running jump into the sea and sprout a luminescent tail and lush locks, but we can get a mermaid-esque mane in a matter of seconds with this pretty red wig. 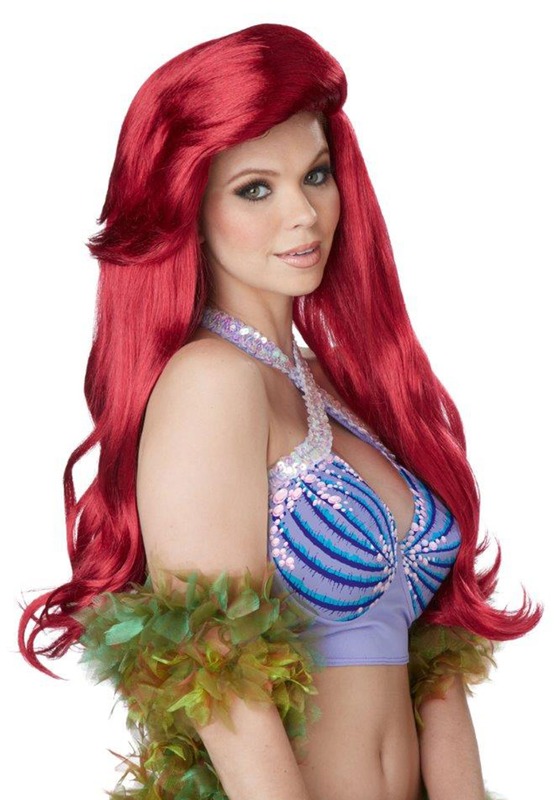 This magical mermaid wig will transform you into a mystical lady of the sea that everyone can recognize because you'll look like the most famous mermaid of all. Bright colored red hair is gathered into a voluminous long hair style, with cascading curls and a side swept bang. Throw on your seaweed boa and become the finned maiden of the ocean that you've always secretly wanted to be!